Halloween got us thinking that someone who took on the terrifying challenge of earning her MBA while penning a debut novel might have some interesting things to say about creativity, marketing and horror movies. Philadelphia area native Stephanie Eaves ’14 wrote “The Endangered” while enrolled here at LeBow. In January, she signed with Zharmae Publishing, and her book is now available for purchase. 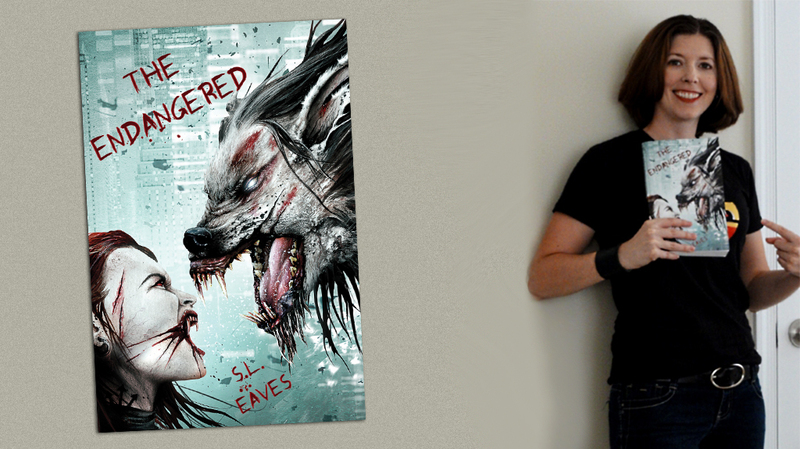 “The Endangered” is certainly on-trend as a vampire and werewolf story. What is the business side of choosing a genre and potential audience? It’s a bit of a double-edged sword. This book, being more along the lines of mystery/crime thriller geared towards an adult audience was a challenge to get published because publishers consider it harder to sell in the post-Twilight market, where young adult vampire romance is still in high demand. I had several agents and publishers respond to my initial query with, “Well, if it was more like ‘Twilight’…” It’s sort of ironic that trying to stay true to genre roots, rather than de-fanging it worked against the book, but that’s where the demand is in that genre right now. However, there is a big audience base for vampires, werewolves and the paranormal in general so it helps to have an established market. The challenge becomes getting the word out to the right niche. In the case of “The Endangered,” the story is grounded in detective fiction with pulp style action and dialogue, but because the main characters are not human it is harder to reach traditional crime fiction readers. By blending elements of several different genres, I aimed to tell a more original story and tried to avoid the usual clichés associated with the genre tropes. This makes “The Endangered” a little tougher to sell since it doesn’t fit into one clearly defined category. And as with many industries, these trends are cyclical, so a little patience doesn’t hurt either. How did you manage your time between the process of writing a novel and your pursuit of an MBA? Creative writing was an outlet I’d turn to when I needed a break from crunching numbers in spreadsheets. Conversely, when writer’s block set in, I could shift my focus to coursework for a welcome change of pace. I think a certain amount of left-right brain balance is important and ultimately helped me with both the MBA curriculum and the manuscript. My publisher was very understanding when it came to deadlines, submitting revisions, that sort of thing. So if I had a week with heavy coursework I could focus on school without that added pressure. As a published author and MBA degree holder, what is next for your career both as an author and otherwise? I honestly never thought I’d actually be published, writing has always been a hobby on the side and not a primary focus, so I’m not in the habit of thinking of it as a career. My goal, like many of my classmates, was to come out of LeBow’s MBA program ready and eager to enter the business world and put these new skills to use. However, the timing of the book’s release has somewhat altered my career objectives. My publisher has ordered a sequel to “The Endangered” and expressed interest in turning it into a series, so at the moment I’m focusing on getting that off the ground. As a new author, I’m also using my marketing background and coursework to help market myself and the book, so my MBA skills are not sitting dormant at the moment, quite the opposite. In reviews, your book has been classified as “urban fantasy.” How did living and going to school in Philadelphia affect your story? Yes, it’s definitely urban fantasy in the sense that the story takes place in a modern, city environment. While Philadelphia is not the setting for the book, it does take place in many majors cities around the globe – London, Amsterdam, New York, Los Angeles to name a few. I grew up in the suburbs of Philadelphia, moved to Pittsburgh for my undergrad and never went back to the suburbs. I’ve lived in several cities and those experiences heavily influence my writing. I guess I just couldn’t see any other environment working for the story and its characters. We’re approaching Halloween, so let’s get some horror advice. What scary books and movies do you recommend to your fellow LeBow students and alumni? That’s tough, there’s so many good ones! For books, I’m a fan of Stephen King’s early work. Particularly “IT,” “Cujo” and “The Shining.” I like Charlie Huston’s pulp noirs; I recommend his vampire series starting with “Already Dead.” The Strain Trilogy by Del Toro and “Hogan” is also worth checking out. For film, I love the classics like “Halloween,” “A Nightmare on Elm Street,” pretty much any Romero film and Clive Barker’s adaptations, particularly the first “Hellraiser” and “Midnight Meat Train.” “Interview with the Vampire,” “The Faculty,” “Dog Soldiers,” “Underworld,” “V/H/S” and “Cabin in the Woods” are a few of my favorites this time of year, too.